With a name like The Big Bad Launcher, you might expect an app jam-packed with features for getting to your files and programs more quickly. But you won't get that with TBBL (donationware): It's a basic, relatively generic launcher that could stand to be even more streamlined. 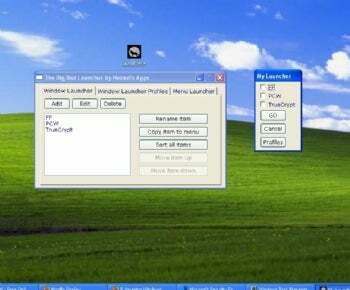 Get to your apps quickly with a simple, slightly ho-hum program launcher The Big Bad Launcher. There's no installation for the app. Just double-click the downloaded launch.exe file and TBBL jumps into your system tray. Then hit the awkward (and unchangeable) hotkey combo CTRL-SHIFT-ALT-Z to bring up the config window. Note that the app drops a config file into whichever directory you start it from, so you may want to move it to its own folder before starting it. You'll need to manually add any program, folder or URL to TBBL's list, and you'll have to choose whether to add it to the Window Launcher or the Menu Launcher. The Window option displays a bordered window with checkboxes that allow for choosing and starting more than one item at a time. The Menu option comes up with a smaller list, where clicking one item fires it up. You can copy items back and forth between the Window Launcher and Menu Launcher lists, but there's really no reason to have two different lists in the first place. Either method of displaying the to-be-launched items should simply draw from the same list. The Big Bad Launcher is neither especially Big nor especially Bad (in any sense of the word). It works easily and quickly, but it doesn't have much to set it apart from the plethora of other launchers out there. If you're looking for a speedy way to fire up your apps, you might also check out the free Enso Launcher (my personal favorite), or the slick, $19 Berokyo. And if you do decide to go with TBBL, the author requests donations via PayPal.